Way back in May I mentioned a TV show that I was working on for Cable TV up here in Fairfax, Virginia about one of America's best known unsolved mysteries: What happened to Amelia Earhart? We've finished the editing and now the show is ready for airing in September. Amelia and her co-pilot Fred Noonan disappeared in 1937, while attempting a round the world flight.. 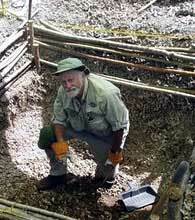 I think you will agree after you see this interview with Dr. Tom King, TIGHAR's leading archaeologist. CLICK HERE to see Part One of the two part series.